I really got off on the wrong foot for one of the quests, finding a pocket watch at the pumpkin patch. I made the mistake of running back east (where I had found their deed) and fought a small army to get inside the farmhouse at THAT pumpkin patch. No watch. However, I did find some nice loot, and I was doing well with leather hording. I went back up to Stormwind to create a bunch of linen and leather auctions. I also wandered through Old Town and met another warrior trainer. He challenged me to defeat a guy in the bar, and rewarded me with a spell after I had done it. 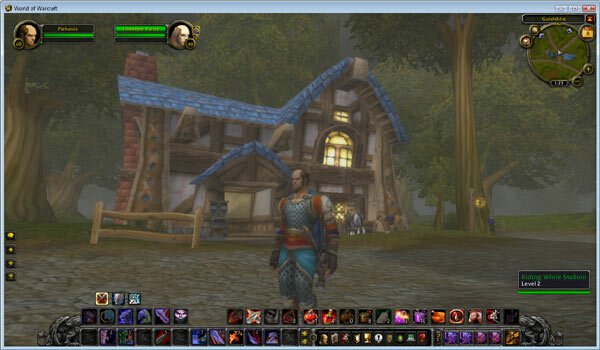 On the way south, I stopped at Goldshire and ran into a dwarf who recognized me. He gave me some grief about only being 14th level and invited me to help him kill "princess", a giant pig who lived at the same pumpkin patch I had just spent a half-hour. I went along anyway, and got the job done.